Every VHDL program consists of at least one entity/architecture pair. In a large design, you will typically write many entity/architecture pairs and connect them together to form a complete circuit. An entity declaration describes the circuit as it appears from the “outside” - from the perspective of its input and output interfaces. The second part of a minimal VHDL design description is the architecture declaration. The mode of the signal used may be IN, OUT, INOUT or BUFFER. IN and OUT are unidirectional pins, while INOUT is bidirectional. BUFFER, is used when the output signal is used internally in the design. The type of the signal may be BIT, STD_LOGIC, INTEGER, etc. The name of the entity should be not use the VHDL reserved words. As shown in above syntax, architecture has two parts, 1) A declarative part where signals and constants are declared and 2) The code part. The name of architecture is any name except VHDL reserved words. The architecture indicates that the circuit is performing NAND operation between the two input signals a and b and assigning the result to the output pin (x). 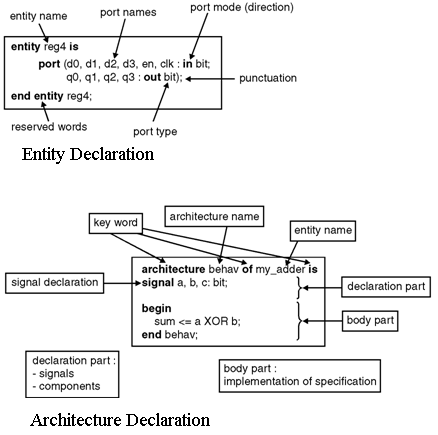 Figure below shows the detailed description of entity and architecture declarations in the VHDL program. Modeling styles in VHDL coding are used to specify the architectural body of the design. The modeling styles can be selected depending upon the complexity of the digital design.